1. 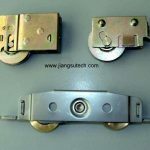 Hanging and Sliding Door Fittings: Pulley, Roller, Wheel, Bearing, Hinge, Lock, Knob, Aluminum Profile, etc. 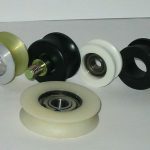 Widely used for windows and doors of furnitures or shower rooms. 2. 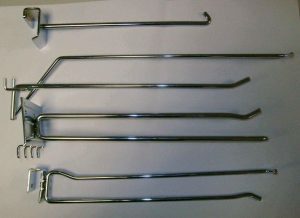 Wire Products: Single Hook, Euro Hook, Hanger, Grill ,Basket, Display Rack, etc. Mainly used in retail store or supermarket shelf, show rack, refrigerator, oven, etc. Surface finishes including electro copper, nickel, chrome, zinc and electrostatic painting are available. Our customers for wire products include WAL-MART,SIEMENS, IBM,WHIRLPOOL ,etc. Euro hook is a great way of displaying a variety of products on a slatwall. 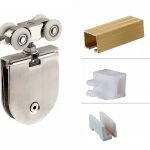 Made out of strong chrome plated steel, this arm hook is a very long lasting addition to any slatwall display. This hook can support a number of products when attached to a slatwall. The hook creates a sturdy and safe display once attached to a slatwall. Requiring no assembly, this single prong arm arrives ready to go onto your slatwall. There is a wide selection of slat walls to choose in the slatwall and accessories section.